A net (also frequently called geta) is a technique where one or more stones are captured by enclosing them, as it were, in a net of stones which has holes in it, all of which the attacker can, however, block. The basic form of a net is in this diagram. 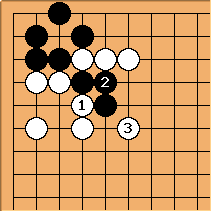 The marked white stone now cannot escape: If White plays a, Black answers at b; if White c, then d.
Capturing two stones in a net. 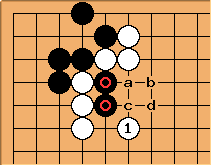 a and b are miai and so are c and d.
In this diagram, White captures the cutting stones with the combination of and in this diagram. From three stones onward, the common technique of for one or two stones does not work anymore. 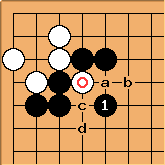 However, if were at a, then we have a position known as the crane's nest tesuji and Black's stones are captured. PJTraill: How about the position in Go Problems # 2083? 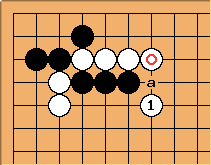 (Not sure if I am allowed to reproduce it here): many complain that it is a (short) ladder / shicho rather than a “geta”, which the setter calls it as of 2018-05-28. In fact it also involves a throw-in + squeezing, so I feel that “geta” is wrong. And what about the keima tesuji? on the cover of the book Tesuji by James Davies? But maybe there is no hard and fast definition of a net (and is that identical with “geta”? ), and in some edge cases it is just a matter of feel. tapir: I read this neat definition: in a ladder you increase liberties by 1, but they always get taken away again, while in a net you never get additional liberties. The Go problem #2083 is a ladder. The keima above does not fit, but looks like a net nonetheless.